M.2-heatsinks review: which SSD-cooler performs best? "Fast m.2-SSDs have the tendency to become quite hot. If you are reading or writing a lot of data, an NVMe-SSD will more often than not throttle in order to keep the temperature within acceptable limits. ... If you are using a fast m.2-SSD that uses the NVMe-protocol, such a heatsink offers a serious advantage. You do not purchase an SSD like that to only apply light load and under heavy load you only achieve the maximum performance if you have sufficient cooling. While we still measure differences between the individual heatsinks, when it comes to the performance it mainly matters that you use a heatsink and not so much which one. 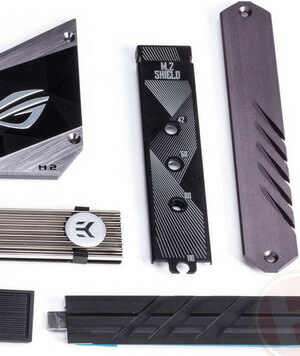 Only the MSI M.2 Shield stands out as a heatsink that is clearly not as effective; we would like to see a better solution with the next generation of that manufacturer. Although we have to add: it does its job, albeit not in the most elegant fashion."